How do physians diagnose a mucous cyst accurately? Why order the doctor an X-ray? Is an ultrasonography evaluation of the finger necessary? Is a MRI or a CT necessary to confirm the diagnosis of a fingercyst? An experienced physician recognizes a mucous cyste by the typical appearance. A digital mucous cyst is most often solitary, flesh-coloured and dome-shaped. 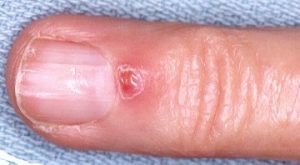 Most cyst are located dorsal at the joint nearest the fingernail. (DIP-joint). In advance cases the overlying skin is very thin an the nail shows an irregular grow. The image on the left shows a finger cyst one week after a break open. Translumination of the fingercyst with light confirm the diagnosis. 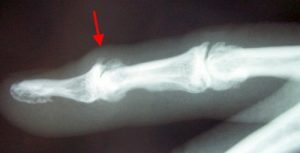 An X-ray of the finger can not show the finger cyst, but X-ray often show the narrwing of the joint space and the osteoarthritis of the joint nearest the fingernail. Important is the X-ray, if an operation is an option! The X-ray often shows bone spurs (red arrow) dorsal of the DIP-joint. These bony spurs had to remove during an operation! 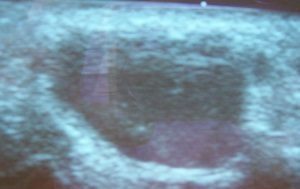 An ultrasonography evaluation can further confirm the diagnosis of a mucous fingercyst. A mucous fingercyst is a small ganglion. During an ultrasonography evaluation, the doctor see in a finger cyst or in a ganglion a hypoechoic mass. The images on the left shows the the typical appearance of a ganglion during ultrasonography evaluation. (For a better understandig, I select a large ganglion of the wrist) The ultrasonography evaluation of a fingercyst show in principle the same picture. Ultrasound ist possible in an office procedure and nearly all patients tolerated ultrasound better then a MRI. malignant tumors of a fingerbone…. The diagnosis of a finger cyst is in nearly all cases (for an experienced physician) not with difficulty.